This year sees the fifth anniversary of the unveiling of the Bronze Woman – the first public monument of a black woman in England. 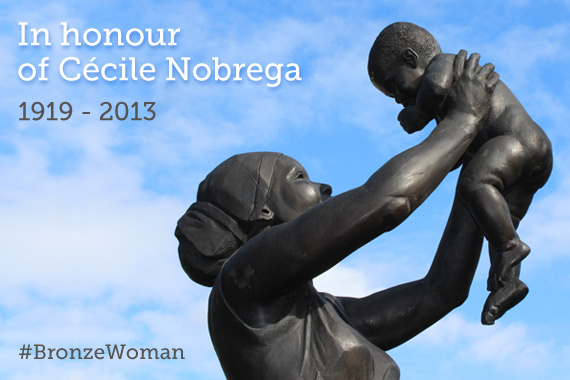 The realised vision of educator, author, musician, poetess and community activist Cécile Nobrega, 1919 – 2013. “Our commitment to Bronze Woman arises from the cultural significance of the landmark project, and the closeness with which it matches Olmec’s mission of race equality through economic and social justice. Olmec’s role in the realisation of Cécile Nobrega’s vision to create a monument celebrating the contribution of African Caribbean woman to society and women everywhere is a proud moment in our history. The poem reflects the history of migration to the UK from the Caribbean, the transatlantic slave trade, and the subjugation of woman, through the poetic reflection on the role of the Caribbean woman. Yet the imagery of the monument and the poem is of endurance , healing, celebration, triumph and hope for the future. 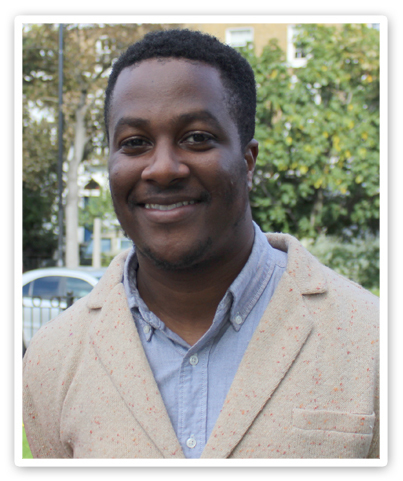 click here to watch this short film by Shem Lawrence (pictured here) and his colleague Oz, from the Social Enterprise Community Roots, to honour Cécile Nobrega and the Bronze Woman on You Tube. The 3m tall Bronze Woman statue of a woman holding a baby is installed in Stockwell Memorial Garden, south London. Olmec, is a BME led social enterprise that champions race equality through economic and social justice, and runs practical programmes designed to empower individual and communities facing disadvantage and act as a catalyst for positive social change. Olmec raised £84,000 funding and found the sculptors and a location for the statue. 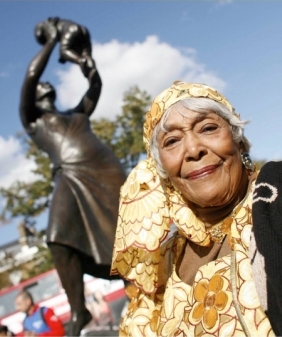 The statue was unveiled by a “circle” of women of Caribbean origin including Doreen Lawrence, artist Anissa-Jane, Baroness Rosalind Howells OBE and Music of Black Origin (MOBO) Awards founder Kanya King. An initial model of the statue was first designed by sculptor Ian Walters, who also created the Nelson Mandela statue in Parliament Square in 2005. Following his death in August 2006, the project was completed by Aleix Barbat, a final year sculpture student at Heatherley’s School of Fine Art in London. Olmec director Tanzeem Ahmed said the monument was “a tribute to the diverse communities that make up British society and a symbol of the potential of women everywhere”. The installation of the statue in 2008 marked the 60th anniversary of the arrival of the Empire Windrush ship to Britain carrying 500 West Indian immigrants, and the 200th anniversary of the end of the transatlantic slave trade. Such a joyous statue. Very interesting post – didn’t know about this until now but so pleased to have read about it. I love that blogging helps me come across these stories that I know nothing about. Thanks for sharing. This is such a lovely statue such a shame that it has took so long to have one though. I was fortunate enough to be in Stockwell on the day the statue was unveiled. Its such a blessing to have the Bronze Woman in Stockwell. We should all be proud of the work Cecile Nobrega done to have this statue in Stockwell. One should be in every borough. By God’s grace. May Cecile Nobrega RIP.